Rory McIlroy. Pic by Harry How/Getty Images. 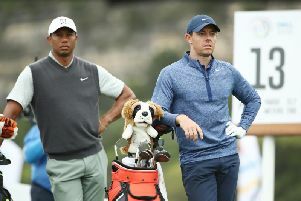 Rory McIlroy is relishing a Texas tussle with Tiger Woods in the WGC-Dell Technologies Match Play on Saturday around the Austin course. Wins for both on Friday led to the highly-anticipated meeting, with McIlroy securing a third win of his week by beating Matt Fitzpatrick on 4&2. Woods’ success over Patrick Cantlay featured a fightback from two down plus brilliant eagle in the 4&2 triumph. “I think it’s really exciting for the tournament, it’s exciting for both of us,” said McIlroy ahead of the last-16 date. “I didn’t put up much of a fight in the Tour Championship last year (when paired in the final round) so hopefully I can give him a better game. 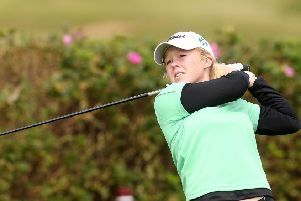 “I feel like pretty much all of this year it’s been close to what I would think is some of my best golf. Brandt Snedeker lost the group lead to Woods with defeat by Aaron Wise. Woods accepted the stroke of good fortune and described facing McIlroy as “a lot of fun”.